At the Cortlandt Colonial Restaurant & Ballroom. 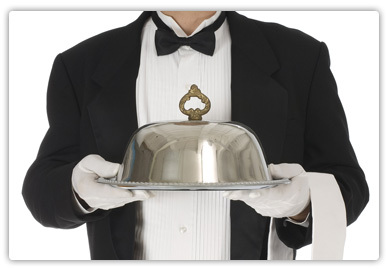 Catering to your every need is our specialty. Our facility boasts a variety of both private and semi-private spaces throughout the establishment to accommodate a broad range of event scenarios. From intimate dinner parties, small social gatherings, and catered business meetings to trade shows, mitzvahs, sweet 16’s, anniversaries, and grand weddings, our facilities can host any event you desire. Large events including weddings, sweet 16’s, bar/bat mitzvahs, anniversaries, business events, fundraisers, sports dinners, charity events, dinner dances, and trade shows, are best accommodated in our main ballroom. Some key features of this room include a marble dance floor, 2 stage areas, and access to our private garden space. Although we can and do custom design menus for each and every event, we do have several packages put together that can serve as a basic guide to our available services. Click here to view our Ball Room catering package options. If you would prefer to host an event outside of our location, let our food come to you! Check out our parties-to-go catering menu by Clicking here. Our Bar/Lounge and Bistro room space can be combined to host cocktail parties for up to 40 guests. Capacity - up to 200 with a dance floor for a buffet or plated meal up to 230 without a dance floor for a buffet or plated meal. Large events including weddings, sweet 16’s, bar/bat mitzvahs, birthdays, anniversaries, business events, fundraisers, sports dinners, charity events, dinner dances, and trade shows, are best accommodated in our main ballroom. Some key features of this room include a marble dance floor, 2 stage areas, and access to our private garden space. Although we can and do custom design menus for each and every event, we do have several packages put together that can serve as a basic guide to our available services. Click here to view our Ball Room catering package options. Capacity – Up to 40 Guests - plated meal or cocktail party. For small private events up to 40 guests, you can turn to our private executive suite, which features it’s own private entrance from the outside and private bathroom also. This room is great for business meetings/luncheons/dinners requiring private space. Weekend availability for this space is very limited, so please contact us for more information on catering in this room. If you would prefer to host an event outside of our location, let our food come to you! 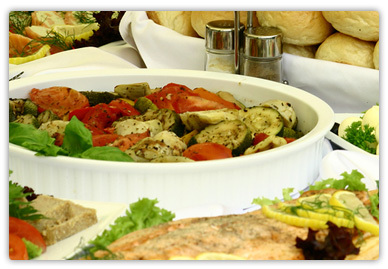 Check out our parties-to-go catering menu catering menu by Clicking here.